Your butterfly looks so pretty! what a clever idea for repurposing those little ribbons. Way to re-use those ribbons, and how clever too! Love this pretty butterfly, and especially that great embossed background! NJ! Gorgeous card Susan. I always cut them off but never thought to save them. Hope you are enjoying the nice weather we are finally getting. A lovely card, andi am so glad to see I’m not the only one who does that with the ribbons! Very pretty card! I’m glad to hear I’m not the only one that saves those ribbons! LOL Thanks! Oh, yes, who can throw away ribbon? 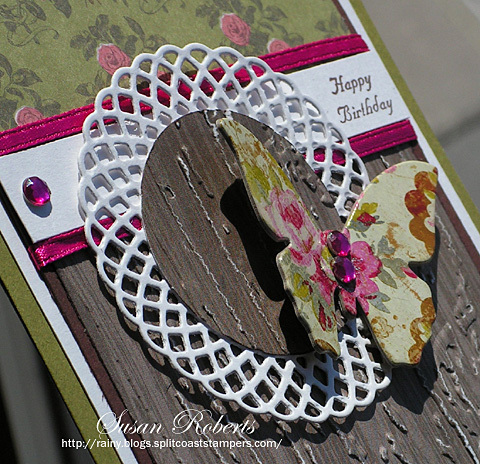 Beautiful card with the chipboard butterfly! Love the realistic look of the Wooden embossing folder. so pretty, love the paper used to decorate the butterfly and like how he is landing on the wood texture background. Great recycling idea, never thought of using those straps for ribbon treatment on cards! Very pretty! Love the wood distressed look! What a clever idea on using those ribbons! Beautiful, Susan! Love the colors and textures!